The next time we meet, we'll be on the other side of light. 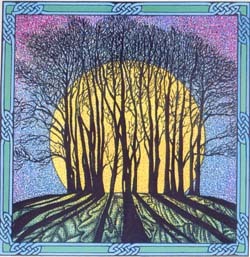 Winter Solstice is on Monday December 21st at 9:49pm Mountain Time. One of the many great lessons I've learned from Melody Beattie is to honor our own "Holy Days." Some of us get down with Christmas, some Rosh Hashanah, others Halloween. I've recently taken to calling myself a birthday stalker; for whatever reason, my birthday and other people's birthdays make me so glad. I can't say exactly why the shortest day of the year is one of my favorite days of the year, but it is. This upcoming deepest night, just like any other change of season or moon phase is an opportunity. "Make an offering that you can either burn or bury of something written or drawn on a piece of paper folded up. You can add symbolic objects, photos, incense, sage, and decorations. Tie it up or just fold the paper around your offering. Say a prayer where you ask the Spirit of the WEST and Pacha Mama to receive that which you are letting go of, leaving behind and completing on this solstice. Breathe all the energy and emotions connected to your release into your offering and then bury or burn it, releasing it to spirit. Make sure to include great gratitude for all the lessons, wisdom and growth you acquired over the past year. Include forgiveness and compassion for yourself and for others. Once you do a ritual like this it is important to fill the new space with something fresh and new. You may not know what that is yet, but you can symbolize it with flowers, beauty, love and joy. And for those who do know exactly what you wish to bring in, write it, or draw it and place it on an altar or in a place where you can honor it daily as you move." Whatever you do or don't do to acknowledge or not acknowledge, I wish you peace.